A cyclonic storm now referred to as the 1964 Rameswaram cyclone or the Dhanushkodi cyclone started with the depression that formed in the South Andaman Sea on December 17, 1964. On December 19, it intensified into a severe cyclonic storm. From December 21, it moved westwards, 400 km to 550 km per day. On December 22, it crossed Vavunia in Sri Lanka with a wind speed of 280 km per hour. On December 22-23 night, the cyclone moved into Palk Strait and made landfall in Dhanushkodi, at the southern tip of Rameswaram island, on the eastern coast of Tamil Nadu, India. The devastating tidal waves that were 7 metres high submerged all houses and other structures in Dhanushkodi town with heavy casualties. On December 22, 1964, the tidal wave smashed into the Pamban-Dhanushkodi Passenger train and washed it into the sea while it was crossing the viaduct during the cyclonic storm. The railway track in Dhanushkodi destroyed by the cyclone of December 22 – 25, 1964. More than 100 passengers drowned in the sea. The death toll was estimated to be anywhere between 115 and 200. The variation is due to the many ticketless travellers. The railway line running from Pamban Station to Dhanushkodi Pier was washed away. The 1¼ mile-long Pamban Rail Bridge over the Pamban Channel, that links the Indian mainland with the island of Rameswaram was also badly damaged; 126 of its 145 girders collapsed. However, the lift span was barely damaged. Most of the girders were salvaged from the sea and the Pamban viaduct was working once again in a span of just three months time. The metre gauge branch line from Pamban Junction to Dhanushkodi was abandoned after the cyclone destroyed it. Prior to the cyclone, Dhanushkodi was once a flourishing town. Then, the Railway line to Dhanushkodi, destroyed in the 1964 cyclone, went directly from Mandapam station to Dhanushkodi without touching Rameswaram. In those days Dhanushkodi had a railway station, a small railway hospital, primary schools, a post office, customs and port offices. There were hotels, dharmashalas (religious rest houses), and many textile shops that catered to the Hindu pilgrims and travellers to Sri Lanka. Dhanushkodi is about 18 miles (29 km) West of Talaimannar, Sri Lanka (then Ceylon). There was a steamer ferry service which operated daily from the pier on the south-east of the Dhanushkodi town to the pier at Talaimannar. The ferry transported travellers and goods, across the Palk Strait. In the 1950s and 1960s, I used to travel to Ceylon by the Dhanushkodi-Talimannar steamer ferry. The Indo-Ceylon Express, also known as the Boat Mail train, plied from 1915 to 1964 on a metre gauge track between Egmore Station in Chennai (then known as Madras) and Dhanushkodi. It took almost 19 hours to complete the journey of 420 miles (675 Km). Ferry service from Dhanushkodi Pier to Talaimannar in the 1950s. After the Boat Mail train reached Dhanushkodi Pier at 15:05 hours in the afternoon, the passengers after alighting from the train had to pass through the customs before boarding the ferry which used to leave the Indian shore soon after 16:00 hours. Depending on the weather, it took between 2 and 3½ hours to cross the very shallow Palk Bay and reach the Talaimannar Pier in Sri Lanka. The voyage used to be bumpy and nauseating when the sea was rough. The name of the train changed from Indo-Ceylon Express to Rameswaram Express after the 1964 cyclone. Now, it is a 12-hour journey from Chennai to Rameswaram on a broad-gauge track. On June 12, 2014, my wife and I along with relatives left Chennai on Rameswaram Express to attend a wedding at Pamban town. We reached Rameswaram the following day around 5:30 am and lodged in a hotel. We hired a van and left the hotel around 11:00 am to see Dhanushkodi. After travelling for 20 minutes, we reached Dhanushkodi. Even 50 years after the cyclone of 1964, Dhanushkodi remains a dilapidated strip of land. The driver stopped the van at a spot on the Indian Ocean side where many other vans carrying tourists were parked. The driver said he cannot go farther as local regulations, meaning rules set by the local cartel of van drivers, forbids it. But the members of that association ply a number of their own vans to ferry the travellers to the end of Dhanushkodi and charge ₹100/- per person. At the end of the journey we paid ₹2,200/-. After 35 minutes of a bumpy ride by van, on shallow waters and muddy tracts, we reached the tip of Dhanushkodi where Adam’s Bridge, a chain of sand shoals between Dhanushkodi and Talaimannar begins. The distance from the tip of Dhanushkodi in India and Talimannar in Sri Lanka is about 18 miles (29 km). The Dhanushkodi fishermen say that some sand dunes are just 50 yards in length. 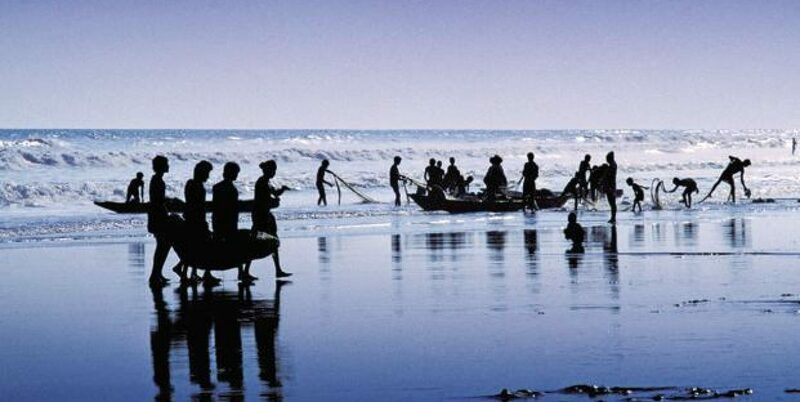 Surprisingly, the smallest land border in the world, is a shoal in Palk Bay between India and Sri Lanka – just 45 metres in length. An eerie stillness prevailed around us except for the chatter of the few tourists subdued by the sound of waves. There were a few marine birds pecking on the soggy earth searching for food and many sea eagles circling in the air ready to swoop on any prey they could spot in the shallow waters or on the muddy land. We saw many Hindu pilgrims bathing in the Palk Bay. The Hindus believe that pilgrimage to the holy city of Kashi (Benares / Varanasi) in North India would not be complete without having the ritual bath at the tip of Dhanushkodi, considered a sacred confluence of the Palk Bay and the Indian Ocean, before completing their pilgrimage to Rameswaram. It was heartrending to see only thatched huts and no buildings with standing walls. The only walls we saw were the dilapidated walls of St. Anthony’s church and of a school devastated during the cyclone of 1964. The main trade other than fishing was the sale of conch shells, and trinkets and ornaments made of shells sold at exorbitant prices to tourists and pilgrims. Eventually, we left Dhanushkodi around 2:30 pm with a heavy heart after having seen the ravages wrought by the 1964 cyclone.